My, oh my, how things have changed in five months. The first time we told you what the best Android phone was that you can buy today, we easily picked the Galaxy S6, even saying that it would be difficult for anyone to top it throughout the year. In our new list of the best Android phones (that you are about to read), surprisingly, it didn’t even show up. That’s pretty wild if you think about it. A phone, that was easily the best Samsung had introduced in two years, topped everything on the market and then some, yet five months later isn’t even one we would suggest as a must-buy today. It just shows you how good phones are today and how improvements are still showing from one to the next within a few month period. So what did top today’s list of the best Android phone you can buy? Let’s find out. The best Android phone you can buy today is the Nexus 6P. Why? For the first time in Nexus history, I think Google has gotten it all right with the Nexus 6P. The phone is beautiful and made with premium materials, has one of the best sets of specs money can buy, uses a really good QHD AMOLED display, has stereo front-facing speakers, and features a top tier camera you will have confidence in, all at a price well below most other flagships. With a starting price of $499 and with this combination of great hardware, software, and the fastest updates to new versions of Android, any complaints we can come up with, don’t hold for long. Plus, this phone works on every single US carrier and gives you wireless freedom to choose the wireless service that best fits your needs, has a fantastic fingerprint scanner, will last you through a day on a single charge, and is helping introduce the world to USB Type-C.
What’s wrong with it, though? One could complain about the size of the phone, limited availability, and lack of an SD card slot, water resistance, and wireless charging, but most of those complaints feel like we’re nitpicking. OK, I’ll give you the size argument as this phone is quite large. In fact, it’s close to being as large as LG’s ridiculously oversized V10, only this phone manages to feel so much better in hand. And honestly, since almost every single phone released these days is a whale on some level, it just seems like wasted breath complaining about size. It’s not like you have much of a choice any longer – big phones are here to stay and your only option. Seriously, Google did such a great job ticking all of the boxes here that this is the easiest Nexus recommendation I have ever made. In the past, all Nexus phones included a “but,” but not this time. 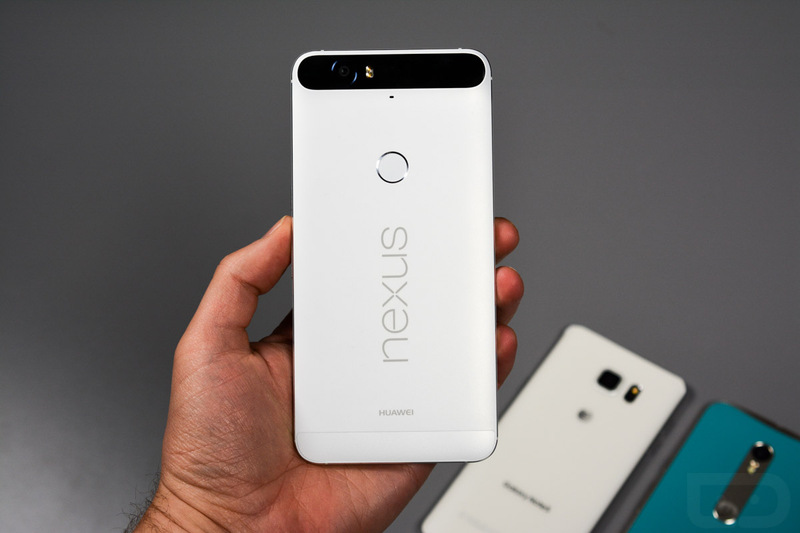 Be sure to read our Nexus 6P review if you haven’t already. You can buy the Nexus 6P at the Google Store. A really close runner-up is the Samsung Galaxy Note 5. Why? The only reason the Galaxy Note 5 isn’t the best phone you can buy today is because of its software. Otherwise, this phone is every bit as good as the Nexus 6P, if not better in a number of ways. The Galaxy Note 5 is stunningly gorgeous with its metal frame and glass paneling. It also features the best smartphone camera I have ever used, the best display in any mobile device, is a showcase for exclusive Samsung features like fast wireless charging and Samsung Pay, and includes an S Pen should you need one! Like the 6P, this a large phone, but Samsung has done such an incredible job at designing it, that it almost feels small when you hold it next to Google’s Nexus. It has this glorious curve to its backside that fits so well in your hand and zero side bezel, leaving you with a “large” phone in the footprint of something you might think is much smaller. What’s so bad about the software? Nothing is specifically “bad” about the Note 5’s software, it’s just that it’s not as clean, fast, or up-to-date as what you’ll get with the Nexus 6P. The Galaxy Note 5 runs Samsung’s bloated and known-to-get-slower-over-time TouchWiz skin, and isn’t yet running Android 6.0 Marshmallow nor do we even know when it will. Samsung seems to have gotten much better about software updates over the past year, so there is a chance you will see the major update before long. It’s just that when you aren’t Google’s phone with direct lines to Google’s latest software updates, you get interference from manufacturers and carriers, and that can lead to down-the-road frustration. The Note 5 is absolutely a tech wonder that you can’t go wrong with, assuming that having the latest software isn’t an area you care much about. 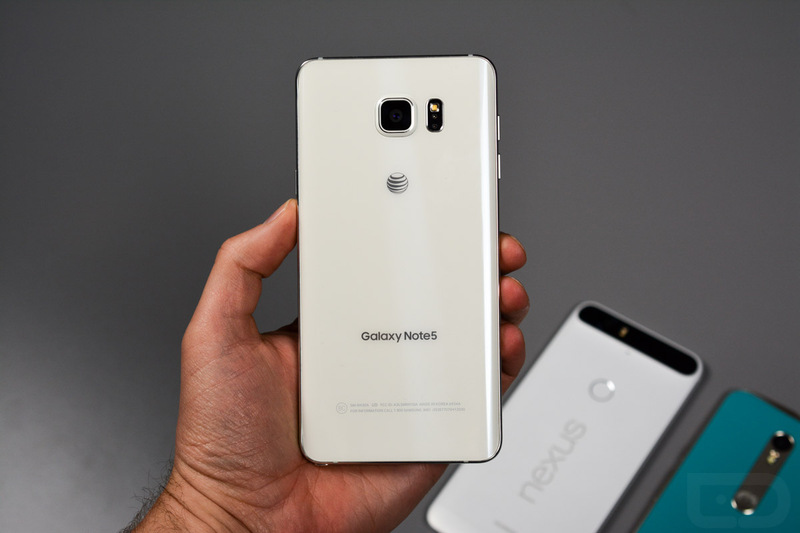 Be sure to read our Galaxy Note 5 review if you haven’t already. You can buy the Note 5 from Samsung and all of the major US carriers. 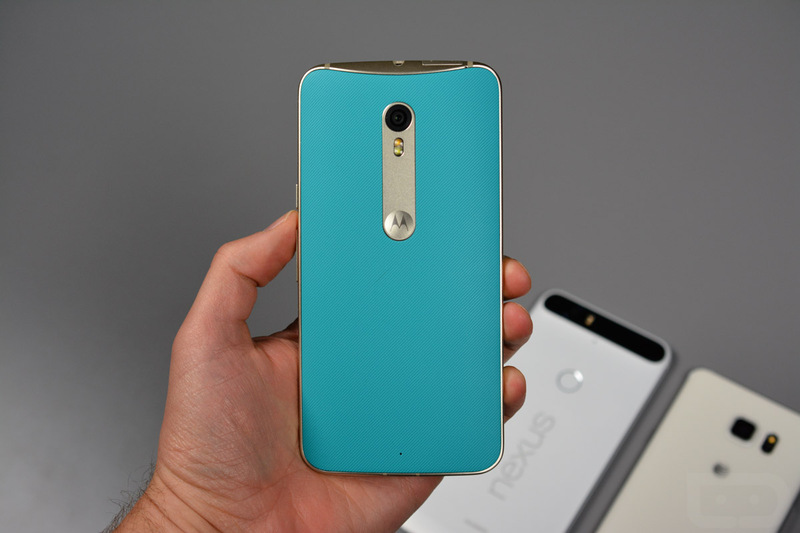 If you can’t stand either of those phones, go with the Moto X Pure Edition. Why? Because it’s a lot like a Nexus in terms of the clean software approach, yet Motorola is still offering one of the best add-on software packages available in Moto Display and Voice. Along with that valuable software approach, Motorola will let you fully customize this phone to your liking and will sell it to you directly for as low as $399 with unlocked connectivity on all of the major US carriers. Motorola also introduced their best mobile camera ever in the Moto X Pure and re-introduced a microSD slot, something neither of the phones above have. 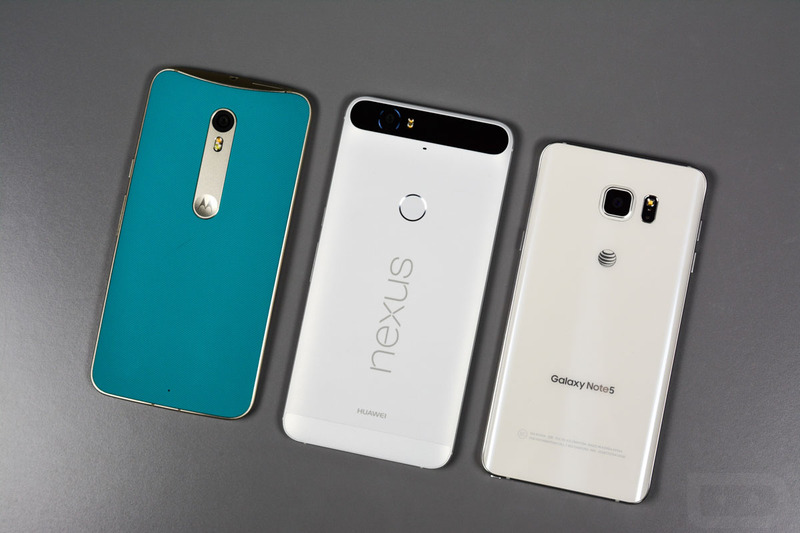 Why doesn’t it top the 6P or Note 5, though? This phone doesn’t have a fingerprint scanner or a top-tier display, and Motorola’s software support post-Lenovo acquisition has really come into question. In fact, that’s really the only major issue here. We just don’t know if we can rely on Motorola for timely and prolonged software updates. Be sure to read our Moto X Pure Edition review if you haven’t already. You can buy the Moto X Pure Edition directly from Motorola’s store. Pushbullet Announces Paid Pro Version, Monthly Fee for "Features Worth Paying For"